Bud Fraze (Fraze@q.com) has kindly offered take over the workshops while I recuperate. Please give him all the support you have given me in the past. The Cochise Defensive Pistol Workshop is open to the public and is sponsored by the Cochise Gun Club in Sierra Vista, Arizona. Shooters at all levels are welcome, including beginners, ladies and teens. This workshop will give your an opportunity to work on skill development that should help you increase your performance at the match. Workshops are held on the the fourth Saturday of each month at the Sierra Vista Range. Sign up starts at 8:30 a.m. Mandatory safety briefing starts at 9:00 a.m.
Equipment and ammunition requirements are the same as the match. Minimum recommended caliber is 9mm, however, smaller calibers can be used. Basic safety rules will be reviewed. Pistol shooting fundamentals will be practiced using dry and live fire. Reloads will be practiced, at least two magazines or speed loaders will be needed. Specific defensive pistol match skill will be practiced as defined by workshop leader. Usually a stage that resembles a typical Defensive Pistol Match stage will be practiced. Participants are encouraged to provide constructive critiques to each other to help develop skills. 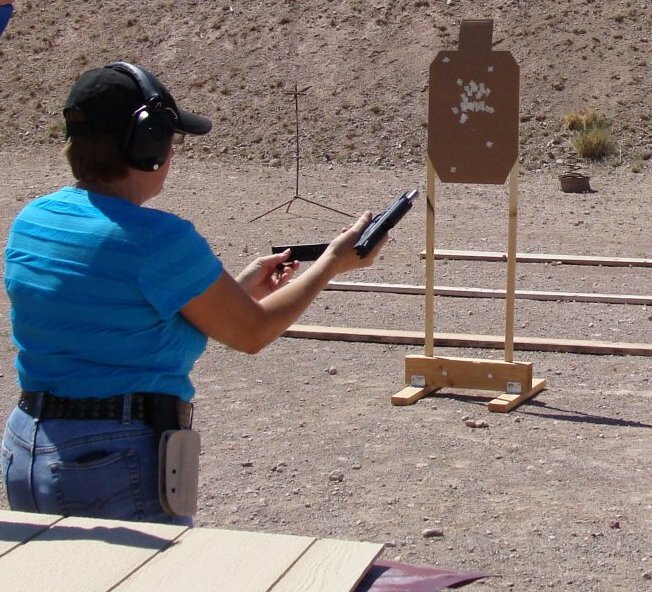 Skill development practiced here will enhance Concealed Carry Permit instruction. This workshop is not self defense pistol training, but, the gun handling skills practiced will augment your self defense capabilities. Although new shooters are welcome, this is NOT a substitute for Basic Pistol Instruction. Never point a gun at something you are not prepared to destroy. Always be sure of your target and what is behind it.